Nowhere is this truer than in American politics. 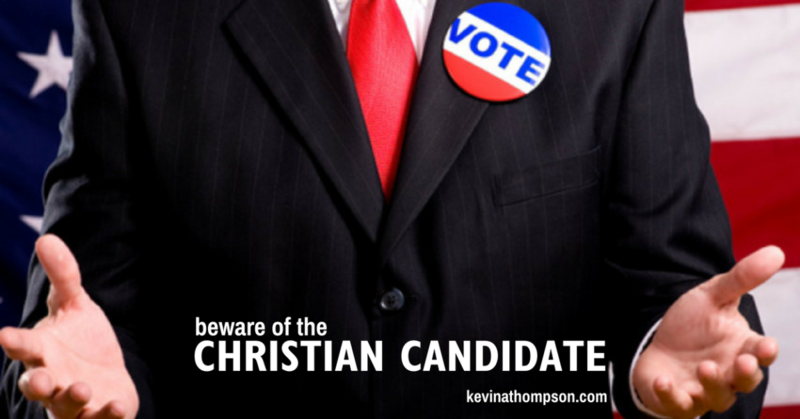 Every election cycle, people with nominal faith attempt to exploit the American Christian in order to get a vote. They are wise in doing so because not only is the faithful voting bloc a large number of voters, we also tend to be very gullible for charlatans pretending to be people of faith. I have no problem with a candidate telling me about their faith. Part of the election process is explaining who you are as a candidate. Just as I couldn’t explain myself without mentioning faith, I don’t expect others of faith to tell their story without mentioning their faith journey. But there are certain things citizens can look for to make sure a candidate hasn’t just come to Jesus for the sake of getting votes. 1. Look for a story more than a soundbite. Any speech writer can make someone sound like a person of faith. With a little code-language dropped into a speech, the politician can sound like one of us. A speech can be faked, but it’s harder to be deceptive with your personal story. A follower of Jesus has a story of how they came to follow Christ. It’s not always dramatic, but there are some key details which led to the decision. When someone is faking faith for a vote, they might speak the language but they don’t have a personal story. 2. Look for doctrine more than description. While a new believer may not know much about doctrine, a maturing believer should. They should have a set of core values derived from their theological beliefs. Someone using Christianity in order to gain popularity won’t be able to understand or explain key doctrinal concepts like salvation, creation, the nature of humanity, etc. 3. Look for Jesus more than God. It’s easy to say someone believes in God because it’s such a general term they can define it however they wish. It’s something far different to say someone is a follower of Jesus. He spoke words, gave commands, and set out a perspective on life. If you believe in Jesus, you believe in the value of every human being. If you follow Jesus, you are commanded to handle conflict and disagreement in a different way. God-language is general but Jesus-language is specific. Look for the latter. 4. Look for costs more than benefits. It takes discernment, but consider if the politician claiming faith has ever paid any price for that faith. Have they lived off less money because they give to the church? Have friendships been hindered or behaviors been changed because they follow Jesus? If they have never paid a price for their faith, but now want to benefit from it by getting your vote, beware. 5. Look for the Gospel. It sounds silly, but this is the most basic step to identifying a person of faith. Of course, to look for the Gospel, we must understand it. The message of Jesus differs from the American Dream or the prosperity gospel or a “do-good-ism” which many people believe. The Gospel is about God’s saving actions toward sinners through the death, burial, and resurrection of Jesus. Most politicians who claim faith, don’t communicate the Gospel. They should be looked at skeptically. While I live in a geographical oddity where being a Christian gets a candidate more votes than it costs them, one simple test for a politician rings true. If a candidate’s faith doesn’t cost them some votes, specifically from the religious community, their faith is probably not sincere.